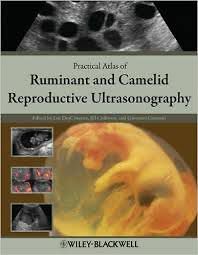 Practical Atlas of Ruminant and Camelid Reproductive Ultrasonography is a practical, fully referenced, imagebased guide to the essential concepts of reproductive ultrasound in domesticated ruminants and camelids. Providing information to enable practitioners to incorporate ultrasound service into their practices, the book also includes more specialized information for advanced techniques such as fetal sexing, embryo transfer, color Doppler, and others. With broad species coverage encompassing the cow, water buffalo, sheep, goats, alpacas, and llamas, Practical Atlas of Ruminant and Camelid Reproductive Ultrasonography is an essential guide to using ultrasound technology in ruminant practice. Offering comprehensive coverage of ruminant reproductive ultrasound, the book is written by a group of 25 leading experts in this technology from 11 countries. Practical Atlas of Ruminant and Camelid Reproductive Ultrasonography is a musthave reference for ruminant and camelid practitioners, instructors, and students.